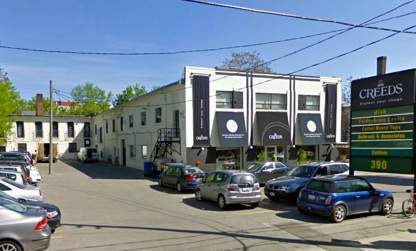 Located in Toronto's Dupont By the Castle neighbourhood, this retail property is in a prime location filled with specialty stores and professional services. This portion of Dupont Street has high foot traffic due to the Casa Loma Campus of George Brown College being just half a kilometre away. Public transit in the area includes the 26 Dupont east- and westbound TTC routes and walking access to the Dupont Subway Station at Spadina Avenue. This two-storey building, anchored by Creeds Coffee Bar, features five units with prominent signage available on the building and at the street. Parking consists of front and side lots totalling approximately 15 spaces. Green P street parking is also available.